Now that the year is coming to a close, many of us start to think about the year that has been and the year that is in the offing. Will the coming year be 'better' than the last one was? Today I offer you a poetry book that is all about hoping for what could be. Imagine what our world would be like if people could set aside their differences. Imagine the lives our children could lead. For many people, today is a day to spend with loved ones. It is a day to look around at the people we love best and give thanks for them. In today's picture book you will meet a charming little creature who is not really sure where he belongs and who he belongs to. He ends up taking a journey, and in the process he figures out something very important about what home is. Before they found him, Boris’ parents tried to have a baby of their own, but doctors told them that they would not be able to have a child. They had given up hope that they would be able to become parents, so when they found Boris on the edge of the swamp they were delighted. They could not care less that the baby had gills. They did not care where he came from even. All that mattered was that he was now theirs. Boris grew up to be a perfectly normal boy except that he had gills, and eyes that were a little bigger than usual. His life was happy, or so he thought. Then one day Boris picked up the scent of the swamp on the air. The aroma tugged at him and questions rattled around in his head. Was he really living the life that he was supposed to be living? One morning Boris left home and began to walk, pulled along by the smell that was haunting him. Finally Boris came to the swamp, and at last he felt complete and at home. In the swamp he belonged, and he fitted in with the other creatures who were like him. Boris was happy for a while until he began to realize that he was not exactly like his neighbors in the swamp. He began to feel homesick, and he wondered if he really was in the right place after all. Should he go home or should he stay in the swamp? This wonderful, magical picture book explores the idea of what a home is. The unique artwork offers a stunning backdrop for a text that is powerful and memorable. For me, the holiday season is a time to give thanks for all the wonderful things that I have in my life. One of these things is my home, my planet, which is such a beautiful, remarkable, and precious place. I have been lucky enough to see some incredible wild places in my life. I have seen the Himalayas, the Great Rift Valley, the Alps, and the Grand Canyon. I have seen a desert in Jordan, a rain forest in India, and a pristine coral reef in the Indian Ocean. What a diverse and rich planet we live on. In honor of our home, today's poetry book celebrates the Earth, the blue planet. We live on a remarkable planet, a place where there are oceans and mountains, where precious gems can be found underground, where earthquakes shake the earth, and where glaciers creep down valleys. There are wonders everywhere we look, if we look hard enough. It is a place that is changing all the time, sometimes in small ways that we don’t even notice, and sometimes in terrifying ways that turn our lives upside down. In this wonderful alphabet book we get to explore some of the features of our planet. For each letter of the alphabet we explore a topic in verse and in prose, and these sections of text are presented alongside a wonderful piece of art. For the letter H we find out about hurricanes, those powerful storms that build over warm ocean water and then, sometimes, come “straight for land – oh what a scare!” The informational text that accompanies the poem tells us how big hurricanes are, how they form, and what happens when hurricanes make landfall. This is the kind of book that a child can grow with. Young readers will enjoy looking at the pictures and having the poems read to them. An older reader will get a lot out of the informational text that builds on what the poem tells us. Alphabet books’ sole purpose used to be to help children learn their ABC’s. Now such titles help children learn about so many topics that are relevant to their lives. By combining artwork, nonfiction information, and poetry, the creators of this book give children a singular reading experience. In a week it will be Christmas Day. At this time next Monday we will be putting our meal in the oven, and then perhaps we will take the dogs for a walk to build up an appetite for the feast to come. It seems very fitting therefore that today's picture book should be a book about Father Christmas or Santa Claus. It is a wonderful story that I think truly captures the spirit of the season. Plus I cannot resist books by William Joyce. How I love his retro style art. It was just before Christmas Day when a most mysterious looking box appeared outside the home belonging to Art Atchinson Aimesworth’s aunt and uncle. Art and his little sister Esther had been orphaned, and they now lived with their aunt and uncle on their farm in Abilene, Texas. Art and his best friend Spaulding examined the box with great interest, and when they poked it the words, “Open the box. Assemble the contents. Come NORTH. Yours, S.C.” appeared on it. Santa Claus himself had summoned them! No one in their right mind would consider ignoring an invitation from the great man, and so the boys set about assembling the machine that they found inside the box. It was not long before the flying machine that was going to carry them to the North Pole was ready – with one big modification. 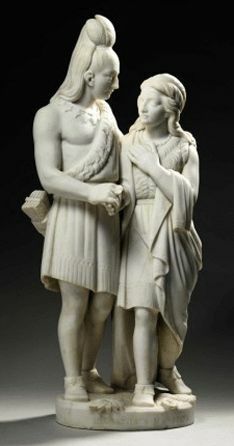 At first Art was determined that Esther would not go on the trip, but in the end he allowed her to join the adventure. Soon enough the children arrived at the North Pole, and they were welcomed by the captain of the Santarian Guard, who came to collect them in a dogless sled. They did not get far before they were attacked by an army of Dark Elves. The Queen tried to kidnap the children but all three of them were very handy their sling shots and snow balls, and Esther even managed to hit the Queen herself. When they reached Toyland, and what a wondrous place that was, they met Mrs. Claus and then Santa. Art was eager to know why Santa had summoned them, but the wonderful man only said, “Some mysteries are best left unsolved.” He then invited the children to go on his famous Christmas Eve ride, which they were happy to do. Unfortunately, they did not get far before the Dark Elves kidnapped Esther and carried her off. William Joyce has a gift for creating delightful stories that have a delicious retro feel. 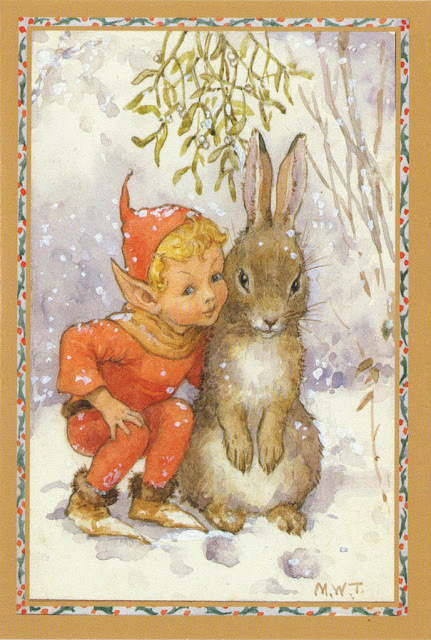 Children will be thrilled when they see the rich worlds that cover the pages of this book; worlds that take us back in time, and that also take us to the fantastical place that Santa calls home. The purpose of Art’s visit to Toyland is kept from us until the very last moment, when all is revealed. Then we can smile, knowing that Santa always listens to the hopes of dreams of little children. On our farm we get animal visitors all day and all night long. Owls live in our barn and soon after it gets dark they come out to look for food. Skunks also come out at night, and we have to be careful not to get too close to them when they are waddling around. During the day the scrub jays rule the roost, yelling at anyone who wanders into their territory. In today's beautiful poetry picture book we get to explore what are animals are doing during the day and at night. We also get to take a journey, month by month, through the year to see how the lives of animals are impacted by the changing seasons. When you have a very full life it is so easy to forget that you are not the only one who is busy. There are little (and sometimes big) creatures around you who have full days too. Many species of animals have busy nights instead because they are nocturnal. While we are fast asleep in our beds, they are out and about looking for food, taking care of their young, and building their homes. All year long animals are active, day and night. In this beautiful book the author takes us through the year, month by month, and she shows us what animals are up to. We begin in January and we see a bald eagle “On a clear Winter’s day,” that is diving through the air down towards a snow-covered landscape. The powerful bird is just about to scoop a fish out of a river with its talons. In the evening a pack of coyotes make their way to the top of a ridge, and there they raise their noses into the air to howl into the sky. By the time March comes around the snow is gone, the trees have new leaves, and on a bright morning we can see the “silken design” that a spider spun. When the sun sets, a pair of skunks comes out to “Dig for plump worms” in the soft soil. In July quail parents, with their small, fluffy babies following them in a line, spend the daylight hours “searching for grass seeds / On which they will dine.” When the moon comes up the quail are resting, but the crickets climb up blades of grass to sing by the light of the full moon. Throughout this singular book, beautiful lines of poetry are accompanied by gorgeous illustrations. Together they take us into the lives of all kinds of creatures. We marvel at the rich scenes that we are offered, and perhaps seeing these moments in time will encourage us to look for similar ones in our own wild places. Taking a leap into the unknown is scary, and yet people all over the world do it every day, and have been doing it for centuries. Explorers have set off to seek out new lands, and inventors have dared to put forward their ideas, not knowing how they would be received. Writers have written books about controversial subjects, and artists and musicians have pushed the boundaries of artistic expression. Marco lives in the Land of the Foxes, and his brain teems with questions about the world. When he asks the other foxes his questions they don’t know what to think of Marco. All they care about is their stew. What do Marco’s questions have to do with that? Hoping to find the answers to his questions, Marco volunteers to join the deers’ crew. A flock of pigeons would also like to join as they want to have some adventures. The Captain, Sylvia, explains that they are headed for a wonderful island. That evening he cooks everyone a warming stew, and then they all consult the charts to figure out how to get Sweet Tree Island, which is their destination. Finally, the storm dissipates and they are able to raise the sails under a beautiful full moon. In the morning they come to the Maze of Sharp Rocks. They could easily get wrecked on the rocky shoal, but the pigeons fly ahead and find a clear path for the ship to follow. The travelers are getting close to Sweet Tree Island when they are waylaid by a pirate ship. Adventures seem to be waiting for them around every corner. 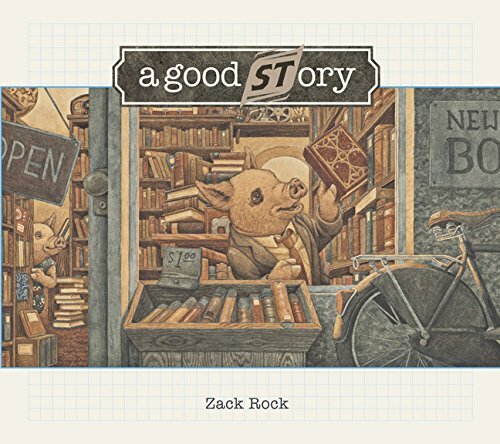 Young readers are going to love this delightful and richly illustrated picture storybook. They will appreciate the fact that adventures sometimes have uncomfortable and even frightening moments, but that does not mean that one shouldn’t take them in the first place. I have been lucky enough to read and review a wide variety of children's books over the last fifteen years or so. During that time I have really enjoyed seeing how authors and illustrators take on new challenges, and present stories and information in fresh and creative ways. Poetry books in particular have come a long way, and I really look forward to seeing the new titles that come out. In today's poetry title the author uses a series of poems to tell us the story of Miguel Cervantes, the author of Don Quixote. The poems are beautifully written and are accompanied by lovely illustrations. Knowing how precious books are Miguel is horrified when he witnesses a book burning. The books are being destroyed because they contain imagined stories. Miguel knows that his knight, the one that is hidden away in is imagination, would “rescue the flaming pages” if he were real. Despite of his father’s ways, Miguel manages to learn to read and write in one of the schools he attends. The boy learns to write his own plays and poems, and when he is older one of his teachers includes four of Miguel’s poems in a book that is published. In this beautifully illustrated book a series of image-rich poems tells the story of Miguel Cervantes, and it is easy to see how the idea of Don Quixote might have grown in Miguel’s imagination when he was a child. He needed to believe in something good when his own life was so hard and so full of uncertainty. At the back of the book readers will further information about Miguel Cervantes and his famous knight character. When times get hard, people often take a break from their lives so that they can rest and refresh. They go on a trip, go for a run or a hike, get out into nature, and spend time with the people that they love best. They knit or make music, work with wood or sew a quilt. Many of us dive into the pages of a book so that we can take a breather. One of my favorite series of books that I turn to when I need a pick-me-up are the Brambly Hedge stories. The characters in these tales are mice and voles, and they live in a beautiful countryside world working, playing, and celebrating together. When you enter the world of Brambly Hedge you are immediately wrapped in a cozy blanket of friendship and good cheer. Here problems are solved through hard work, creativity, and cooperation. Life is simple and rich. When your visit is over you will return to the 'real' world warmed through, hopeful, and ready to face what comes next. In the last few years two collections of these little books have been republished. One box set contains four adventure story picture books, and the other contains four seasonal story picture books. I am lucky enough to have one of these sets and today I bring you a review of one of the stories in the collection. All four of the stories in the set are a joy to read and share. 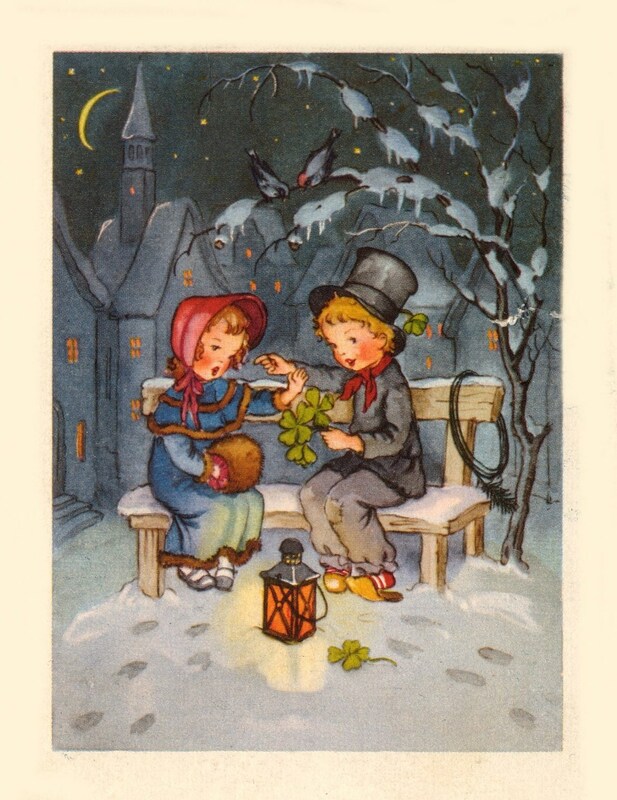 In just a few short hours the Midwinter celebration is going to take place. All the Brambley Hedge mice are busy preparing for this big event. In the Old Oak Palace, Primrose and her friend Wilfred are trying to find a quiet place where they can practice the recitation that they are going to give in the evening. They also need to find something to wear for their performance; something special. 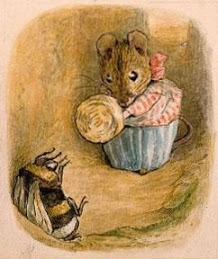 Luckily Primrose’s mother is very knowledgeable and she advises the little mice to go up into the attics. There they will be able to practice in peace, and it is very likely that they will find some good costumes to wear as well. While they are exploring the attics, Primrose and Wilfred discover a hidden door, and behind it there is a long winding staircase. At the top of the staircase the mice children find the most beautiful and elaborate room. In fact, there are a whole set of rooms up there that are packed with fascinating things to look at. Wilfred and Primrose have their very own secret house to play in and to explore. 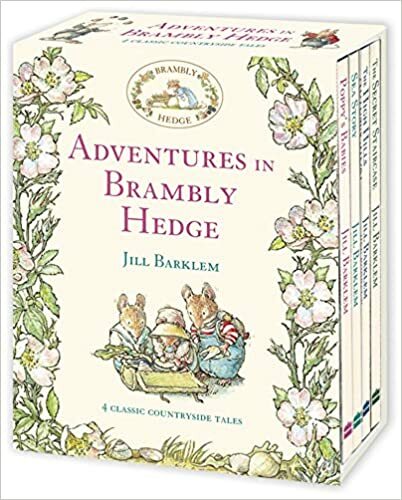 Young readers will be hard put not to feel very envious of the young mice friends in this Brambly Hedge tale; what a delightful adventure they have. With a wonderful story and beautiful illustrations that are packed with cunning little details, this is a book that young readers and their families will treasure. We like to think that we live in a world where people can speak out and say what is on their mind whenever they want to. Sometimes, and in some places, this is the case. However, in many countries around the world, too many of them in fact, people are either imprisoned or permanently silenced when they express opinions that governments, regimes, or dictators do not agree with. Today I bring you a book that is a tribute to the people who dare to speak out against the powers that be. These are people who risk losing their freedom or their lives when they express their opinions. The story is also a tribute to the people and organizations who support the prisoners, who write to them, and who refuse to forget them. One day a father and his little girl attend a peaceful demonstration. Or at least that is what it is supposed to be. The protestors are peaceful, but the soldiers who confront them are not. They attack and the father is struck on the head and thrown into a van that drives away. His poor little daughter witnesses the whole horrific event. The father is cast into a prison and there he languishes day after day. He feeds a bird who comes to his window, and a mouse who visits his cell. He draws a picture of himself and his daughter on the wall and remembers the good times. Then the bird he fed brings him a letter, a letter which makes him weep. Unfortunately, the guard sees the father reading the letter and he takes it away. He takes away all the other letters that the bird delivers. The guard burns the letters, sending smoke and fragments of paper up into the air. Perhaps he imagines that he has won this battle. But he has not. This extraordinary book was inspired by Amnesty International’s Writes for Rights letter-writing campaign. The human rights organization encouraged people from around the world to write to people who had “been unjustly imprisoned for his or her ideas.” The author wrote to prisoners, and being a part of such a meaningful effort made him want to tell a story; this story. Children who follow the story in this book will see how many voices can indeed bring about change. They will come to appreciate that everyone, anyone, can make the world a better place if they try. I apologize for being silent for so long. I have a chronic illness which, for some reason that I do not understand, has been creating havoc with my health for a while now. The last few weeks have been particularly trying. I coped very well for years, but now the careful balance of work and rest that I have developed for myself no longer seems to be working. Hopefully I will figure out what the new balance is soon and I will be able to bring you posts of reviews consistently and on time. Thank you all for your patience and for your friendship. A little over fourteen years ago I brought home a sick, miserable little bundle of fur. Pippin was a puppy mill rescue and he became one of my best friends. He went where I went, and loved me unconditionally, even when I was not at my best. He put up with sharing his home with a young child, a pig, and numerous cats and dogs. He even had to contend with grumpy docks patrolling his garden. He was love personified and his friendship mean a great deal to me. Knowing how precious such a friendship is, I decided to share this review with you. It perfectly captures how powerful the bond between a human and a dog can be. From the moment Astrid was born Eli was a part of her life. He was her first friend and he went on to become her bodyguard, her favorite pillow, and her roommate. It did not matter in the least that Astrid was a little girl and that Eli was a boy dog. They were besties. Then Astrid began to notice that she was getting bigger than her large furry friend. As she was getting taller Eli was getting older, and by the time Astrid was six Eli was an old dog who walked more slowly than he used to. One day, when they were in the park, Astrid shared her popcorn with Eli and then she took him on the slide with her so that he could try it. When they got home she put together a bucket list of all the things Eli should do before he was too old to do them. She and Eli would go through the list. Together the two friends rode on a bike, they went to the library where they borrowed lots of books that were about dogs, they went to a movie theatre, they slept outside, and Astrid let Eli sleep under the covers in bed with her. Astrid even gave Eli a bubble bath and brushed him for a whole hour afterwards. Astrid then added one more thing to the list because she knew that her dear friend was slowing down. Best friends are precious things, and in this special book Kate Klise and M. Sarah Klise give us a story that is a celebration of friendship. Their tale also serves as a reminder that we should enjoy our time with loved ones to the fullest. As the story unfolds, we get to see how the relationship between the child and the dog changes over time. The child who was cared for is now the caregiver. I have a special place in my heart for wordless books. I am attracted to them in part because they are such a pure form of storytelling through art. I am also love the fact that anyone can enjoy 'reading' them. Readers of all ages and all nationalities can follow the narrative and interprate it in their own way. Today I bring you a wordless picture book that has such a beautifully paced narrative, and such a clever ending, that I smile every time I think about it. I also happen to really like the main character. There is a sweetness about him that is irresistible. Crocodile is woken up when his alarm goes off. Bleary eyed he gets out of bed, opens the curtains, gets dressed, has breakfast, and then heads out to work. Through the busy streets he walks, stopping to look in a shop window or two. He buys a newspaper before he heads down to the subway. Crocodile patiently waits for his train, and then he gets on board. For a while he reads his newspaper, but then more people get on board and he is wedged in so tight that reading the paper is just not possible. Finally crocodile gets to his destination. He quickly trots up the steps to the street, buys some flowers, buys a roasted chicken, greets a shopkeeper, and then delivers the flowers to a friend. It is time for crocodile to go to work. In this intriguing book readers will thoroughly enjoy sharing Crocodile’s commute, during which they get to see the interesting people that he encounters along the way. Many of the people are quite ordinary looking —though of course who can never tell what a person is like from their outward appearance— but some of them are decidedly different. Best of all, young readers will be quite surprised when they find out what line of work Crocodile is in. Perhaps he is a dentist? Maybe he is a roast chicken connoisseur? I have a confession to make. I do not know much about the Hispanic community here in the U.S. I really have never had the opportunity to learn much about Hispanics, and I know that this is a shame. I therefore was delighted when I came across today's poetry book. On its pages I got to 'meet' some extraordinary Hispanic men and women who have made the world a better place. The United States has been, and is, home to some remarkable Hispanic men and women. Some of them came to the U.S. as refugees or immigrants, while others were born here. Many of these people speak multiple languages, and they stay connected to their native or ancestral land through the meals that they cook, and the festivals that they celebrate. The first person we ‘meet’ is Juan de Miralles. Juan grew up in Cuba, and when he was a grown and successful businessman he visited the United States to help the Americans gain their independence from England. Juan was friends with George Washington, and was with him at Valley Forge when George Washington’s soldiers were suffering due to a lack of warm clothing and other supplies. One of the illnesses that they suffered from was scurvy, and so Juan sent some of his ships to Cuba to bring home limes and guavas, which serve as an excellent cure for scurvy. Felix Varela also came from Cuba, and he chose to become a priest. He was outspoken, and preached “against cruelty, speaking out in favor / of freedom for slaves, and freedom / for the colonies of Spain.” Felix’s words made him so unpopular in Cuba that he had to flee, and he took refuge in the United States, where he took up the cause of the Irish immigrants who had fled Ireland because of the potato famine. The Irish immigrants had so little and needed help, and they also needed someone to protect them against prejudice. Felix helped the Irish build schools, he took care of their sick, and protected their children from bullies. In all we meet eighteen Hispanic men and women in this book who are writers, activists, artists, scientists, teachers, musicians, and more. At the back of the book the author provides her readers with further information about the people she writes about in her poems. This is the kind of the book that people who are not familiar with Hispanic history will find fascinating. They will discover many truly special people on the pages, people who have made the world a richer and better place. I freely admit that I enjoy watching films and programs on the television and on my ipad. I have a Kindle, and I use it all the time. However, I am still a devotee of books. I buy them regularly, and there are books in practically every room in my home. I know that books can offer me things that I cannot get from a screen, and I relish my reading time. Books educate, they comfort, and they entertain. They open doors to different worlds, and show us that there are so many possible paths to take in life. 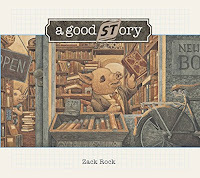 Today I bring you a picture book that celebrates all the things books give us. Through its words a book can become a ship that takes you on a grand adventure with pirates. It can dip under the ocean waves and we can take a journey in a submarine, exploring fascinating undersea worlds that are full of extraordinary sea creatures. With a book for company we can watch a witch stirring her brew, and gaze upon a dragon that is resting on a cloud deep in slumber. We can marvel as flocks of fairies dance around the leaves of trees in a forest. In the glorious picture book a lyrical rhyming text is paired with rich and magical illustrations to take readers on a journey that shows them that books are extraordinary things. They should not be taken for granted, nor should we ever think that they are ‘just’ a book. 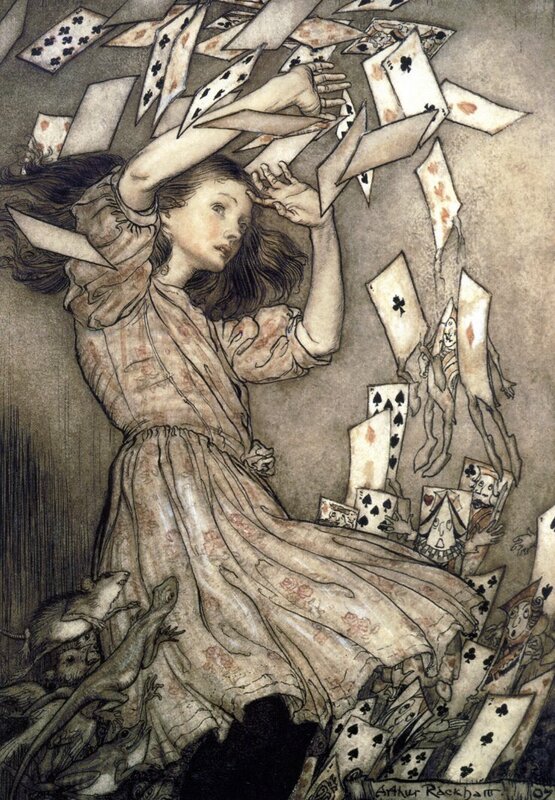 Once we open them up and start to read, the stories and narratives in books can take us into marvelous worlds that are ruled by the imagination, or knowledge, or both. First and second person narratives in historical fiction can give readers a very powerful reading experience. These types of stories can bring history alive so that we can get a sense of what it was like to live in the past. Today I bring you a piece of historical fiction that is presented to the reader in the form of blank verse. It is a remarkable story that everyone, even people who don't care for history, will find interesting. Thus it is that the Tuskegee Experiment begins and it is up to you and the rest of the cadets to prove to the world what you can do. There are only thirteen of you, and your officers are all white; they are all eager not for the medals of a general, but for the opportunity to make history. They have a lot to prove and they are counting on you to prove that they were right to put their faith in you. They are not the only ones who are watching. Indeed, “The eyes of your country are on you,” and the “hopes of your people / rest on your shoulders.” It is a fearsome burden. Days, weeks, and months of classwork and training go by and then you hear about the attack on Pearl Harbor and suddenly more is at stake. A lot more. You are eager to do your part and you follow the war news, and yet nothing happens. You wait and then, at last, the words that you have been waiting for, “Move Out,” are finally heard. You join four hundred of your fellow pilots from the 99th Fighter Squadron and get on a train bound for New York. Written in the second person using a series of poems, this truly special book shows readers what it was like to be a Tuskegee airman before, during, and after WWII. Readers will come to appreciate the challenges that faced African-Americans who wanted to be licensed pilots. They will read about the obstacles that were put in their way even when they wanted to serve their country during wartime. It is sobering to realize that these pilots, who did not lose a bomber in 200 of their 205 missions, and whose military records were exemplary, came home only to face racism and segregation. For the last few weeks I have felt as if the world really is struggling to stay 'upright.' Everywhere I look I see news about hurricanes and wildfires. My own beautiful valley has been shrouded by a fog of heavy, eye-burning, wildfire smoke that leaves me wheezing and exhausted. Then there are all the political conflicts that are disrupting people's lives all over the planet. In a way these are even worse than the challenges that Mother Nature tests us with because they are preventable, and the long-term effects of these kinds of events can last for decades. What is happening in Syria is a perfect example of these man-made disasters. Today I bring you a book about a little boy who loses everything he holds dear when his home is destroyed and he becomes a refugee. When their town is bombed and starts to burn, Sami and his family have no choice but to leave. War has destroyed their home and now they are refugees carrying all that they own on their backs and in their arms. Sami is brokenhearted not just because he has lost his home, but also because he has lost the pet pigeons he loved and cared for. Sami’s father reassures his son that the pigeons “escaped too.” His words gives Sami a little comfort. Sami and his family members walk for several days until they finally come to a refugee camp. Here at last they will be safe. They are given a tent to live in, and it is not long before Father plants a garden, Mother starts cooking meals, and the camp’s children start attending a school that is set up for them. Just like before, the children sing songs, they do math, they play soccer, and they paint pictures, but Sami cannot enjoy doing any of these things. He is too broken-hearted about the loss of his home and his birds. One day Sami is lying on the roof of a building looking up at the sky and daydreaming when four birds arrive. They are refugees in the desert, just like Sami. When you live in a peaceful place where there is no war or conflict, it is hard to imagine what it is like to lose everything. It is hard to imagine what it is like to be a refugee. Unfortunately, today more people have been displaced by conflict and natural disasters than ever before. In many places the new school year has started. Lazy summer days are over and it is time to begin a new chapter. Today I bring you a book about Cat, a character who is funny and sometimes rather opinionated. 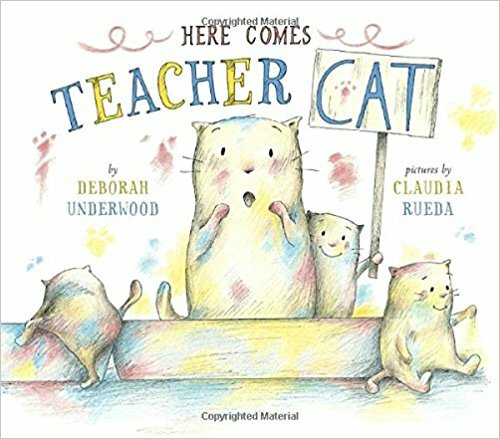 In the story Cat is asked to stand in for a teacher who has to go to a doctor's office, and he discovers that being a teacher is both challenging and rewarding. Cat is fast asleep and when the narrator wakes him up Cat is not pleased. The narrator insists that “this is an emergency,” which it surely is. 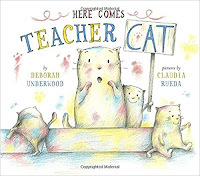 Ms. Melba, the teacher at Kitty School, had to go to the doctor and Cat is going to have to step up and help out. Cat is not keen on the idea at all. In fact, he tries to sneak away, but then the narrator reminds Cat about all the nice things Ms. Melba has done for him. Very reluctantly Cat goes to Kitty Elementary. He actually tries to hide under the teacher’s desk, but the narrator finds him out. Cat is going to have to do something to engage his eager little students and he decides to start with a music lesson. He gives his students drums, a horn, a sax, an electric guitar, a bass, and a keyboard to play. The music is great and they are all having fun but - there always is a but - it is too loud. Cat is going to have to find something else to do. Next Cat and his little charges build something, and then they create some art. Both activities are a great success except for the fact that Cat gets a little carried away. Actually, he gets very carried away and the result is a terrible mess in Ms. Melba’s classroom. What is she going to think when she gets back from the doctor’s office? Cat is never one to do things in moderation. When he gets involved in a project he jumps in with all four paws. Children are going to love seeing how he copes with being a temporary teacher, and how his day actually turns out to be quite enjoyable, all in all. This is the fifth Cat adventure, and once again Cat and the narrator have a wonderful relationship that readers will find amusing and entertaining. You can always trust that Cat will get up to something when you meet him. That’s just how he is, and we love him for it. Many years ago I was sent a manuscript of a novel that was written in blank verse. I will honestly say that I was dreading reading it, but as soon as I began I was hooked. It was so beautifully written, and at times I was in tears as I turned the pages (I was still getting printed manuscripts in the mail at this time.) Since then I have sought out novels written in verse and have spent many hours exploring this wonderful form of writing. Today I bring you an extraordinary example of this poetry genre. The narrative tells the story of a young woman who had to overcome a great deal in her life. We know very little about her, but thankfully we can still look at some of the beautiful sculptures that she created (see an example of her work below the review).